The Netgear N600 is a wireless router that provides 4 ethernet ports, as well as wireless connectivity on both the 2.4 and 5.0 GHz bands. 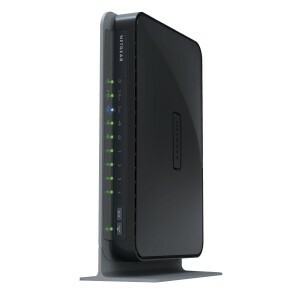 It seems to be a high quality router whose design should see it giving you good service in a number of different scenarios, and whether your upstream connection is ADSL, cable, or even fibre. While I have a minor issue with the layout of the user interface in the setup program, the actual setup of the modem was very easy, and well suited to a novice user. The setup process is well documented in the starting guide, and it’s very easy to get yourself online with this modem. The unit comes with phone and ethernet cables, and an ADSL filter. Start by connecting the phone cable into your phoneline and modem, using the ADSL filter as needed. Plug the ethernet cable into your computer at one end, and the other end into one of the four LAN ports on the modem. Connect the power supply to your mains supply, plug it in to the modem, and turn the modem on. Now, on your computer, load up a browser window, and navigate to the modem, using the URI provided in the start-up guide. Following the instructions, let the modem try to find out how it should connect to your ISP. You may need to enter a username and password at this point, but for most installations, that should be it; you should now be on line. I found that it was pretty easy to add devices to the network. All guided by the permanently available help screens, which appear to the right on the setup screens. And that’s where I have my minor niggles with this modem: why is the help system permanent? This should be optional, and you should be able to call it up at will, as and when you want it. The problem is that its constant presence takes up screen space, and it really makes the screens look very cluttered. Most other applications of this type make the help system available as a pop-up window, and I think that if this were done here, with more space given to the actual tasks of user input, then it would be not just easier on the eyes, but it would appear to be far less complex, and easier to use. Adding a wireless device to the network is pretty easy too; the best way, I believe, is to activate MAC address filtering, thus ensuring that only pre-defined computers may connect wirelessly to your LAN. This, too, was a fairly easy process, and along the way it provides you with a means to tag each MAC address with a label that lets you identify the device being added to the list. Too often this is something that is not considered by the manufacturers, and a year later, you’re left guessing which address in the list belongs to which device. With a little care, you won;t have this problem with the N600. Transfer speeds, both wired and wireless, were very good, with uploads and downloads happening about as quickly as one could expect. The N600 provides you with two forms of upstream connection. You have the usual phone line socket that lets you connect to your phone line for an ADSL connection, but there’s also a gigabit WAN port which will let you connect to a cable modem, or your fibre modem when you get your NBN connection. Then there’s the two USB ports which allow you to connect a couple of USB drives to the modem, and thus also toyour network. In use, it was as easy as plugging in a drive, and then accessing its contents from a computer. Overall, this is a very sound unit for users of all levels of experience, and I recommend it highly.